Arrive in Yangon and transfer to your hotel for check in and overnight at Yangon. Due to various arrival times, meals are on your own. Your full day tour of Yangon will begin with a visit to the city center and Sule Pagoda, the landmark of downtown Yangon, followed by the National Museum, a unique place to learn more about Myanmar. Then its on to Myanmar’s greatest and most beloved attraction – the sacred 325 ft Shwedagon Pagoda believed to contain the relics of 4 previous Buddhas. Afternoon sightseeing includes Bogyoke Market (formerly called Scott Market), where you can shop varieties of goods ranging from handicrafts to clothing and local food/ snack. Our next visit is Chaukhtatgyi, the colossal reclining Buddha, followed by photographing at Kandawgyi (Royal) Lake to view the sunset overlooking at Shwedagon from the park. Dinner and overnight at your hotel. Breakfast at the hotel followed by a transfer to the domestic airport for your short flight to Bagan. Transfer from the airport to the ship for lunch, followed by exploration of a selection of the 3000 plus Bagan monuments by bicycle or coach. Bagan is one of the richest archeological sites in the world and the highlight of every tour through Myanmar. In between 11th and 13th century, the kings of the Bagan dynasty ruled the country and ordered thousands of pagodas and temples to be built. Another full day to explore the wonders of Bagan. Once a bustling trading port, Salay is now a sleepy village filled with colonial architectural treasures and timeless teak monasteries and home to the best known teak carved monastery in Myanmar. We visit the local market and town center by the favored mode of transport – the tuk tuk. We moor overnight near the Chindwin confluence at Aung Pan Chaung. Morning walk through Yandabo villiage, famous for its production of terracotta pottery from the river bank clay. In the afternoon we will be cruising up north towards Mandalay. Sail to Sagaing. The true delight of Sagaing lies in its 1000 hermitages and sanctuaries, rich in woodcarving and religious art. In the afternnon we drive to Amarapura, the former capital of Myanmar where we enjoy a boat ride on Lake Taungthaman followed by watching the sun set behind the world’s longest teak bridge- U Bein Bridge. We also see silk weavers at work in their shop. We cast off early and stop at Mingun to see the largest working bell in the world and the unfinished pagoda that is the largest single mass of brick building in the world. We also visit time permitting, the Mingun Old People’s Home originally established with the assistance of the Irrawaddy Flotilla Company in the 1930s. In the afternoon, sightseeing in central Mandalay with visits to the Palace, surrounding hills, craft workshops and free time to do exploring or shopping on your own. Though Yangon is the modern day capital, Mandalay, or Yadanapura — the ‘City of Gems’, remains the Golden Land’s spiritual capital. To know Mandalay and its pleasant surroundings is to know Myanmar. 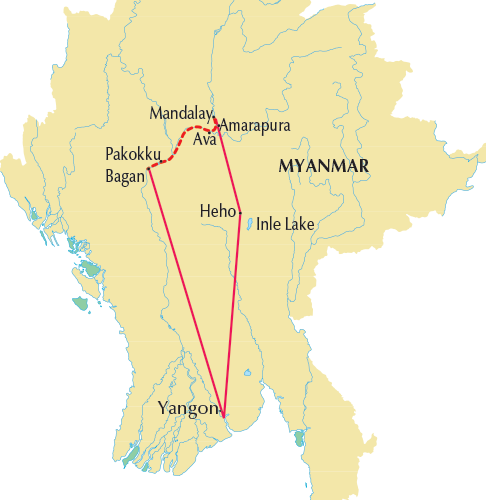 Situated in the heart of Upper Myanmar, the city is at the hub of river routes from China and India and land routes from the Shan massif and Siam beyond. The city throbs with life and trade. This is a city of markets and monasteries. As well as being the economic epicentre of Upper Myanmar, Mandalay is the religious capital of Myanmar. Disembark from the ship. 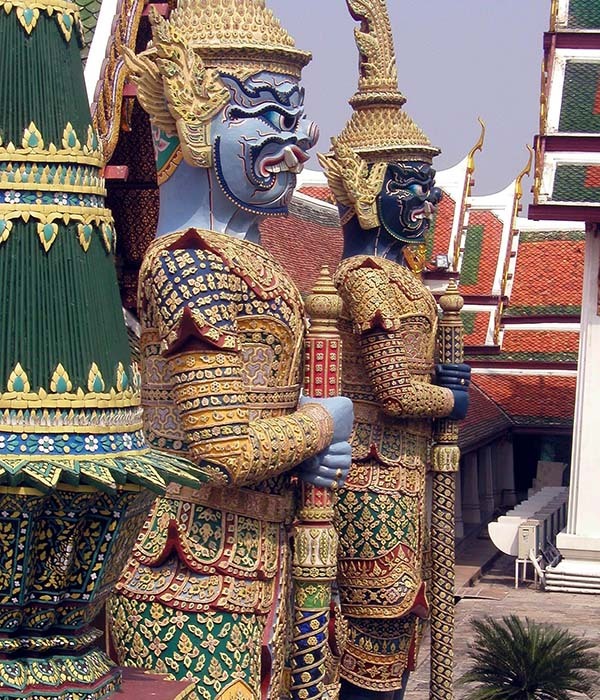 In Mandalay, additional sightseeing includes Mahamuni Buddha Image – believed to be cast in bronze in front of Buddha himself and nowadays gilded with thick gold leaf, gold leaf hammering, tapestry making, marble and wood carving. Transfer to your hotel for dinner and overnight. After breakfast and check-out, transfer to Mandalay airport to fly to Heho. Upon arrival at Heho, drive to Inle lake which takes about an hour. Inle lake, one of the magical lakes in Myanmar is located 900 meters above sea level, is surrounded by beautiful mountains of the Shan plateau, and is the home of the Inthar tribe. If by chance today coincides with market day, we will visit the regional market which is held on a 5 day rotation basis in different areas of the Lake. We will also visit Phaungdawoo Pagoda – famous for its richly gilded five small Buddha images; Ngaphechaung monastery (also known as jumping cat monastery) built more than one and a half century ago and featuring a number of interesting old Buddha images. Other attractions include: unique leg-rowing style and fishing method of the Inthar, floating gardens used as vegetable plantations, silk and cotton weaving cottages and black smiths. Dinner and overnight at Inle Lake. We explore the southern part of the Lake by boat sailing through small twisting and turning creeks to reach Indein village. This small village located on the southwestern bank of the lake is famous for its ruined clusters of pagodas dating back to the 16th century. The tranquil peaceful ambience and the ruins, overgrown with bushes, will bring you centuries back. In the afternoon we will visit Ywama village, and a gold and silver smiths workshop. In the evening, enjoy the sunset while visiting the Inle Lake by boat. Overnight at Inle lake. Transfer to Heho airport to fly back to Yangon. Upon arrival at Yangon, transfer to your hotel. The balance of the day is free to explore on your own. Dinner and overnight at hotel. Breakfast at the hotel. Time to pack your memories away as you transfer to the airport for your flights home. Launched in 2009 and refurbished in 2015, this gorgeous colonial style vessel represents a culmination of style and elegance! 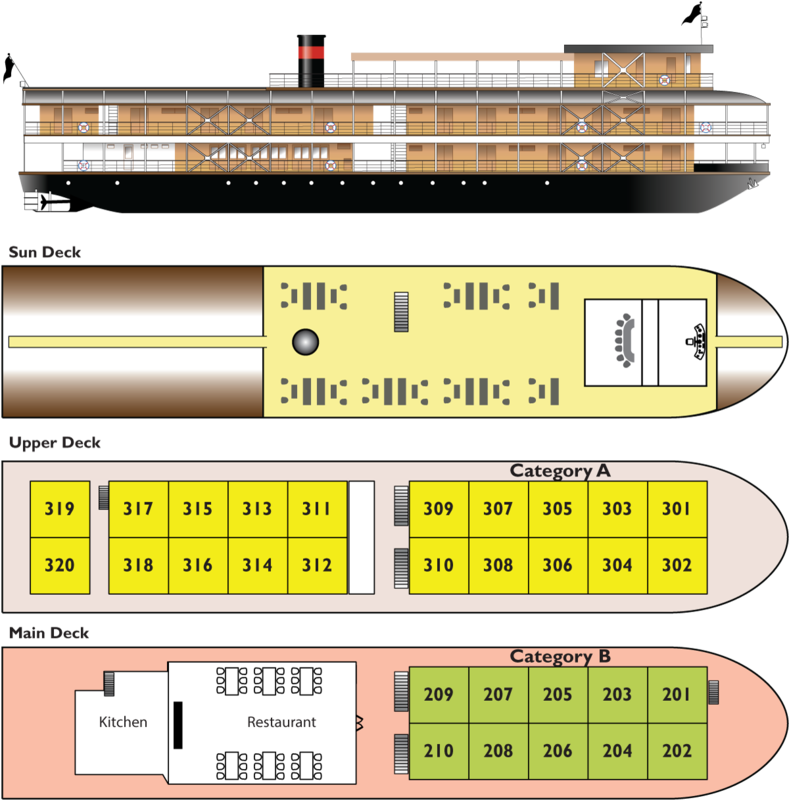 With only 2 decks and a maximum of 60 passengers, the ship was built with locally sourced teak throughout. Her 30 staterooms (10 on the Main Deck and 20 on the Upper Deck) are all a large 170 sq feet in size with teak and stone enhanced private bathrooms with spa branded amenities and hair dryer, full air conditioning, complimentary kimonos and slippers, electronic mini-safes and plenty of storage space in the closet and underneath the uniquely designed beds. All cabins have sliding entry doors enabling the cabins to be opened to the warm breezes along with lounge chairs on the deck providing wonderful views of the passing vistas! Her public areas are equally enchanting! From the one seat restaurant serving delicious buffet style breakfasts, lunches and sit down theme dinners along with free local beer, soft drinks, water, tea and coffee, to the warm and relaxing library, to the generous covered sun deck, along with a spa and gym room, the public areas provide plenty of space for socializing or room for private contemplation. The wonderful, service oriented crew of 30 + a Master Chef and English speaking Cruise Managers are sure to fulfill your every expectation! Non-smoking except in designated outside areas. Download the detailed list of Travel Tips For Golden Myanmar. Yes, travelers from the US need a tourist visa for entry into Myanmar. So before leaving home, please ensure that you have your valid PASSPORT and appropriate VISA. Please make sure your U.S. passport has a validity of at least 6 months beyond your scheduled travel dates so as to not encounter any unnecessary problems. For visa updates, please check with the U.S. or the appropriate foreign consulates at least 90 days prior to your departure. If you are a foreign national – please check with your country’s consulate, as rules may be different. *As of 2015, Myanmar has introduced an online e-visa. Please contact the Embassy of the Republic of the Union of Myanmar in the US at (202) 332-3344 or visit their website: www.mewashingtondc.com for updates. Non-US citizens, please contact your country’s consulate, as requirements may be different. If you have purchased your air tickets through us, your transfers will be included. However, transfers are still available for those who would like to arrange their own airfare, for a fee. Transfers may vary between $65-$130 per person per transfer, depending on the location from where you will be picked up. Which ship will be used for the 2018 Myanmar cruises? THE R/V Orient Pandaw! Launched in 2009 and refurbished in 2015, this gorgeous colonial style vessel represents a culmination of style and elegance! With only 2 decks and a maximum of 60 passengers, the ship was built with locally sourced teak throughout. Her 28 staterooms (10 on the Main Deck and 18 on the Upper Deck) are all a large 170 sq feet in size with teak and stone enhanced private bathrooms, spa branded amenities and hair dryer, full air conditioning, complimentary kimonos and slippers, electronic mini-safes and plenty of storage space in the closet and underneath the uniquely designed beds. All staterooms have sliding entry doors enabling them to be opened to the warm breezes. Comfortable lounge chairs outside the staterooms, provide wonderful views of the passing vistas! Will I be able to make phone calls and check emails while aboard the ship? What is the currency used in Myanmar? Myanmar’s unit of currency is the Myanmar Kyat (MMK) with a current exchange rate of $1 (USD) to $1298 (MMK). However the US Dollar is the most favored and easily exchangeable foreign currency. Please check online for current exchange rates a few days prior to leaving. What methods of payment are accepted on board and on shore? The currency used on board is the US Dollar. All onboard expenses will be charged to your shipboard account and settled the day prior to disembarkation. These expenses may be paid in cash or credit card (Visa or MasterCard only). While traveler’s checks and credit cards are growing in acceptance – their use is still LIMITED to hotels, banks and selected shops in major cities ONLY! Cash is still “king” and the US Dollar is the preferred currency. We would strongly recommend taking US Dollars in cash, as it can be difficult in areas outside of the main cities to change traveler checks. I’m super excited for all the tours! But will I have any free time during the program? How does tipping work in Myanmar? Is it accepted and/or required? Tipping today has become commonplace in countries all over the world, including Myanmar. Due to the nature of these budding economies, salaries for regular folk are pitiful compared to the rising costs and inflation – let alone if we compare them to western standards. For the majority of the people working in the service industries (hotels, ships, restaurants, travel), tips and gratuities have become large sources of their income. Therefore, your gracious generosity will be appreciated throughout your trip. However, tips in the “East” are still left to your discretion. Therefore, no service – no tip! We generally recommend that each person set aside $200 in new and undamaged bills to cover all tipping needs for the total duration of the program – but this is merely a suggested amount. You may leave as little or as much as you feel comfortable with. If you endear yourself to any particular crew member and wish to award them directly – please feel free to do so! For more information about tipping, including Individual vs. Pooled Tipping, please take a look at our detailed Myanmar Travel Tips. Special meal requests are possible. If you have any food allergies or special dietary needs, please be sure to notify our office at least 90 days prior to your departure so that we and the restaurant staff can make every effort to accommodate your needs. Vegetarian selections are always available; however, if you have strict dietary restrictions, you may want to bring some non-perishable snacks, crackers, dried fruits, dietary sweeteners, or other items that will compliment the limited variety of special meals. Anything else I should make sure to pack? For a complete list of suggested items to bring, please read our detailed Myanmar Travel Tips. But here are a few important items that often get overlooked! 2) UNIVERSAL ADAPTER PLUGS for sockets, which are different than at home. Since there are no supplies of converters/adapters on board we highly recommend you purchase a transformer/adapter plug set at any travel or appliance store before you leave. PLEASE DO NOT FORGET: Medications which are vital to your health. A letter should accompany these from your doctor (signed and dated), certifying that such medications are vital to your health. Dosage should be indicated. Always pack any personal medications in your carry-on luggage, not in your checked baggage. Additionally, those passengers with lighter physical disabilities must report them to us at the time of booking. Read full article Know Before You Go – River & Small Ship Cruising to learn more.